2 March 2008: After various trips I've added pages for Goatfell on Arran, Meall a'Bhuachaille in the Cairngorms, A'Mharconaich above Drumochter, Great Shunner Fell in the Pennines, and 3 hills in the Lake District: High Street, Dollywaggon Pike and Harter Fell. 1 Jan 2008: Happy New Year! and Red Pike (Wasdale), some of these photos coming from a particularly good trip to the Black Sail hut in Ennerdale. 5 Dec 2006: Pages added for Ben Chonzie near Comrie and Meall Chuaich near Dalwhinnie. 14 Oct 2006: Pages added for Ben Lomond and Ben Vane in the Southern Highlands and Place Fell in the Lakes. New photo for Fairfield in the Lakes. 7 May 2006: Pages added for High Stile, High Crag, Seat Sandal and Great Calva in the Lakes. 5 March 2006: Pages added for Pen yr Helgi Du and Pen Llithrig y Wrach in Snowdonia. New photos for Snowdon, Crib Goch, Y Lliwedd and Moel Siabod in Snowdonia. 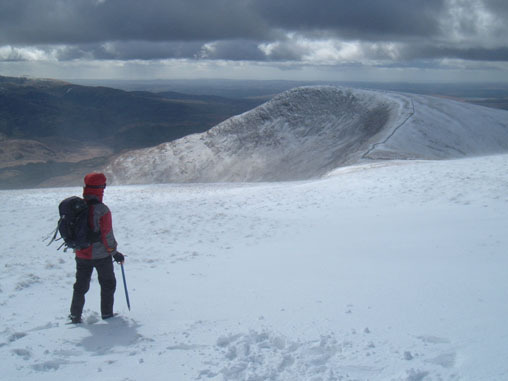 26 February 2006: Pages added for Skiddaw Little Man and Carl Side in the Lakes and The Cheviot in the Cheviots. New photo for Skiddaw in the Lakes. 9 February 2006: Pages added for Great End, Esk Pike, Kirk Fell E Top, Harter Fell (High Street) and Seatallan and new photo for Ill Crag in the Lakes. 28 December 2005: Grahams (5) and Graham Tops (13) added to Brecon Beacons list. Pages added for Wetherlam and Harrison Stickle and new photo for Bow Fell in the Lakes. 23 December 2005: Pages added for Kirk Fell, Lingmell and Yewbarrow N Top and new photo for Great Gable in the Lakes. 20 November 2005: Page added for Skiddaw in the Lakes. Also new photos for Helvellyn and Blencathra. 15 November 2005: Pages added for Blaven on Skye, Sgurr a'Chaorachain, Sgurr Choinnich and Moruisg near Glen Carron, Sgurr Thuilm and Sgurr nan Coireachan above Glen Finnan and Gulvain North of Loch Eil. Also a new photo for Stob Dearg, highest point of Buachaille Etive Mor. 20 August 2005: I've reached the half-way point on the Munros - an ascent of Gulvain taking my tally to 142! 3 May 2005: I'm just back from a 3-day backpacking trip taking in Ben Alder, one of the most exciting mountains in Scotland due to its size and remoteness. Since the first version of Simon's Mountain Lists in December 1999 I've had lots of emails from visitors. Sometimes people have asked me questions and sometimes they've pointed out errors on the site or offered their own opinions. Please send me an email at simon@simonsmountainlists.com.